Scripture tells us that, just one week before his crucifixion, Jesus rode in triumph into Jerusalem. We also are told that, before this ride of triumph, he was very specific in his instructions to his disciples about the animal that he wished to ride. As we know, it was a donkey. He even told his disciples where they would find the specific donkey that he wished to ride for the purpose. We might ask why such a humble animal was the mount of choice for this moment of supreme acknowledgement and recognition of Jesus’ earthly worth. The worldly reason might have been a practical one: a donkey certainly would have been a readily-available animal. And the symbolic reason might seem apparent enough: what more humble animal than a donkey to underscore Jesus’ own humility? What more telling way to demonstrate to the crowd that they might hail him as a king, but that his own trappings of kingship were the very things of their own everyday use? This is as far as explanations usually go. But is it possible to go a little further, to dig a little deeper, to discover that there is more to this tableau of humility and triumph than at first seems apparent? A carving which was discovered on a pillar in Rome depicts, of all things, a crucified donkey. This rough carving, which dates from the second century, might at first seem mocking: perhaps the equivalent of a political cartoon of its day. But the image points us towards a mystic teaching of Gnosticism, in which the donkey is symbolic of the human ego. And a fitting symbol it is! Like the obstinate and stubborn donkey, the ego can be unruly. We might wish to go in one direction, but the donkey (and the ego) insists on asserting its own will, on telling us that it is the most important thing there is, and its will carries us along with it. Putting the ego in its place, triumphing over its illusory dominance, is a striving common to various beliefs. In Zen Buddhism it is symbolised by the bull, which in its temperament is seen as being much like the wilful donkey. To ride the bull is therefore the embodiment of subjugating the pompous ego, of achieving a necessary detachment from the forest of illusions which clamour for our attention and insist to us that they are real. But riding the bull, riding the donkey, is not the final phase of the process. In these mystic teachings we are told that only with the complete defeat of the ego will true transcendence find place. The bull will itself be seen as an illusion and will dissolve and vanish. The donkey will be sacrificed on the cross of worldly pretence - and the man as well. For the supreme triumph is not the ride, but the moment of ultimate transcendence that will surely follow. 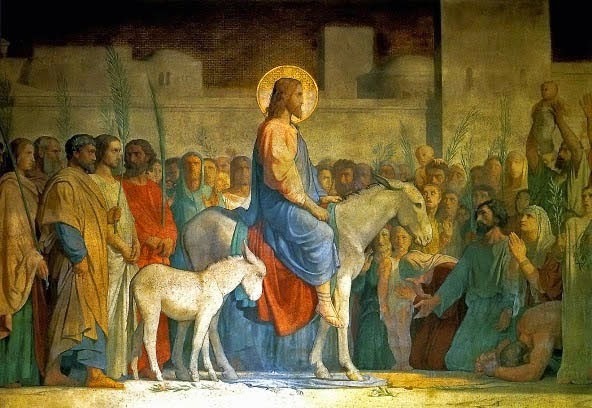 Riding the Donkey is a deeply perceptive explanation of the imagery of the donkey in the story of Jesus. We may look upon the donkey as a symbol of humility. This seems to be the common interpretation and I believe this is an excellent explanation, however as Emma points out the donkey is similar to the symbol of the bull in Zen. They both point to mastering and rising above the willful ego. A remarkable spiritual insight is most wonderfully revealed in the last paragraph, "The bull will itself be seen as an illusion and will dissolve and vanish...." We may then ask ourselves what is the ego? The ego is illusion, the illusion of self, of a false or misguided identity. As long as one is identified with this illusion any attempt to subjugate, control and master the ego will be ultimately fruitless. As soon as some mastery has set in.. there is the thought, "I have mastered this," and this thought of the "I" being the master is yet again generated from an illusion of self! It is like trying to be great at humility! To think "I am really humble" is nothing more than hidden pride stemming from ego. The transcendence of illusion comes from letting go of the 'ego' or 'self' and in this process of surrendering, there is the emergence of what has been fundamentally with us all along - the true Self, our true nature. Dissolving illusion and the realization of Truth represent two sides of the same coin. Buddha stated that enlightenment is not possible without illusion. The transcendence of the ego occurs upon the realization that it is ultimately illusory, and from here there arises an awakening to our true nature. 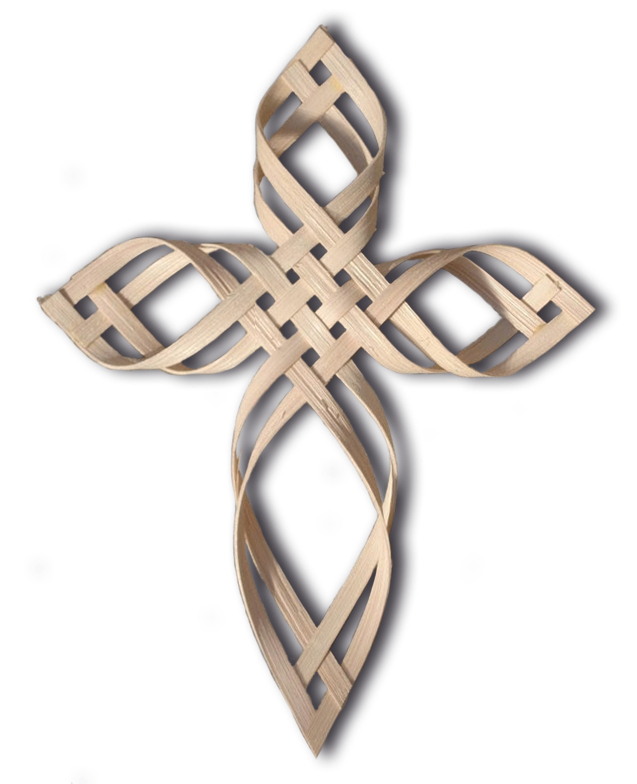 Also the Cherokee basket weave cross at the centre is one of Buddhism's eight Auspicious Symbols, the knot of eternity, and at the same time it also the Christian cross. It seems very apt for this blog that unites the two spiritual traditions, Christianity and Buddhism. Thank you for writing this wonderful blog, and sharing your wisdom and insight. Thank you so much, Joseph - it's beautiful what you say, and I am also grateful for your expounding of the Cherokee basket weave cross symbols which augment what we have said here. Thank you so much, Joseph - your explanation of the nature of the ego and illusion is so clearly expressed, and adds much to what we already have said here. As you mention, to think in terms of 'I' ('I am really humble', etc.) is still to be bound up in the assertive ego, to succumb to the power of that illusion. It's a hard mindset to break through, of course it is, and for most of us it's an ongoing effort! If we extract the Gnostic lesson from this episode of scripture (which is really so similar to Eastern modes of thought and mysticism), we can see that, in making his ride through Jerusalem, Jesus obviously did not himself need to learn such a lesson, but rather was providing the crowd (and the subsequent readers of this gospel) with a vivid didactic picture, an example, for them to follow. He used the phrase: 'for those with ears to hear, let them hear.' to signal that his actions had a deeper meaning than those which were outwardly obvious. All the lessons, all the instructions, all the examples are already there for us to follow, both in Eastern and in Western mysticism - if we are open to them! Thank you Emma! And thank you dear Hawkwood for the additional insight about the Gnostic perspective. Indeed, Jesus' actions were direct expressions of the highest Self that is within all of us. We can learn so much from his actions as well as his words. His words appear simple but it is only now that I am beginning to glimpse the depth and truth of his parables and teachings. And being open, as you stated, is key. The lessons we look for on the outside eventually point to the sacred within us and, ultimately, the answers come from there.